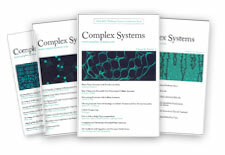 Join the leading edge of complex systems research today! © 1987– Complex Systems Publications, Inc. Your subscription will begin with the current volume. Reprints are available for back issues. *Prices in US dollars. Outside the USA, add $20 for surface mail or $75 for airmail. +Students must be enrolled full-time in an accredited college or university.